With each new technology, we look to the future with apprehension and anticipation, fearing change but yearning for the latest convenience that will enrich our standard of living. At the turn of the last century, the telephone was just beginning to gain recognition. Looking back, it’s difficult to imagine what our lives would look like without this remarkable invention. Fast forward 100 years later, and we’re just beginning to recognize the potential of the latest game-changing technology, augmented reality (AR). Augmented reality offers a new way to interpret the world around us by superimposing a secondary reality through the use of a screen – whether a television, smartphone, or tablet. With endless applications to enhance the way we operate, AR has the potential to greatly impact our daily lives, from education, to travel, to marketing – and virtually everything else in between. Early anecdotal evidence from brands suggests that augmented reality is poised to be the next great innovation of influence. In Canada, the home improvement store is leveraging AR to save marriages. No longer do couples need to dispute over which sink fixture would look best with their quartz countertops by “envisioning” it. A special 20-by-20-foot room was designed using 3-D technology and augmented reality to offer users the ability to select features and walk through a virtual floor plan to view their selections. Does this mean no more fabric swatches or paint samples? Lowe’s believes this service will be of more benefit than simply offering their customers a way to experience their dream home. By promoting this new service, Lowe’s expects more customers will be heading to their stores to experience the SciFi-inspired “holoroom.” In addition to the new traffic, Lowe’s plans to use this technology as a way to aggregate data about design features and regional trends. Yelp is not new news, nor is its AR feature, Monocle. After celebrating 10 years as a bridge between a local business directory and social media network, Yelp remains a trusted resource for researching hours, directions, or customer feedback and reviews of local businesses. However, one of the most underrated features of Yelp is the ability to view restaurants and businesses around you by using your camera, GPS, and compass navigation. In 2009, Yelp secretly introduced Monocle to iPhone users, later making it available to Android users. Whether because of the secret launch or the tendency for Yelpers to use the resource on the web versus the app, the Monocle feature doesn’t seem to be receiving its due praise. If you’re new in town or just searching for a new place to discover, use Monocle as your go-to guide to any city where Yelp operates. It provides a visual list of restaurants, bars, and businesses surrounding your current location – displayed as an overlay on your screen – with access to ratings, reviews, hours of operation, and range of prices. Wherever your phone’s camera is facing, the display reflects what options are seen through the screen. By taking out the extra steps of having to do a web-based search of the “best independent coffee shops in Charlestown,” Yelp takes the guesswork out of exploring new venues. Smartphone in hand, your next adventure is just a step away. The advice of English teachers to “show don’t tell” in one’s written compositions was taken literally by Pedigree Books, a UK company that has teamed up with augmented reality app designer Zappar to reimagine the children’s book. This is the second year Pedigree will be spicing up their children’s books with exclusive content, interactive covers, coloring games, and poster creations. While other interactive children’s resources have had an appeal, by incorporating a digital AR element to a physical book, kids are learning to engage with books and reading in a whole new way. Print is alive – but interpreted in a new form. What did the wild, wild, west look like before it was settled? What about the Forum or Parthenon in the ancient world? What was Berlin like when it was split in two? For the world traveler and history buff alike, time travel would be the superpower of choice – and TimeTraveler and Metaio make it possible. More than a guided tour through the historic city of Berlin, this AR app provides users a window into the past with videos, reconstructions of demolished sites, and stories as though it was all happening in real time. After viewing this video, it is clear that both visitors and casual passers-by are clamoring to experience this new view of Berlin. An inexpensive and unobtrusive way to offer a guided tour could be the best innovation for the tourism industry. The ability to open up your smartphone or tablet to a wealth of historical information for sites around the world is a game-changer for both the novice traveler and the jet-setter. The applications for augmented reality seem to vary within the different contexts we have covered. However, LA-based startup DAQRI wins for putting the technology to its most innovative use. 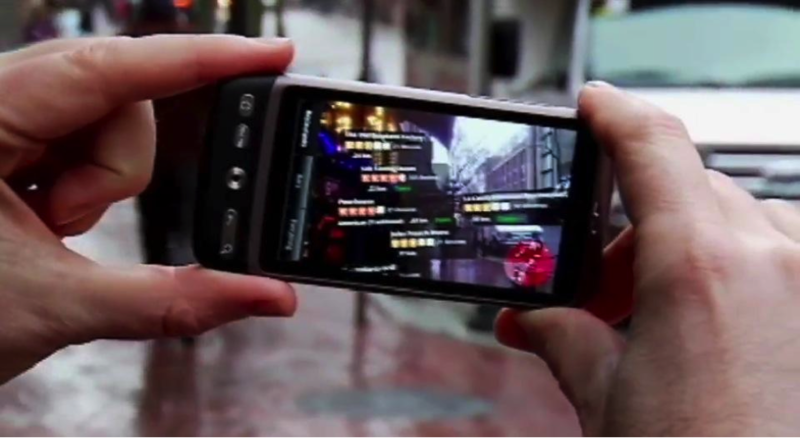 Not simply altering the type of information displayed, but how the information is conveyed to the user is what makes this augmented reality tool unique. Was sliced bread the pinnacle of innovation? Augmented reality begs to differ. While its rudimentary functions have been around for years, the infinite uses of AR are just being tapped into. With the capability to change tourism, education, shopping, and manufacturing, one can readily see that augmented reality has a chance to become the next big thing. Perhaps 100 years from now, we’ll look back on this technology like we do the telephone and ask ourselves how we ever survived without it. This article highlights only a few applications of AR technology. What are some other ways businesses can use augmented reality to improve internal operations or enhance the customer experience? What are some creative ways that organizations can incorporate AR technology into their existing marketing strategy? How does AR fit into a brand’s overall IDM strategy?